Share this product and receive a $5.35 sharing discount. 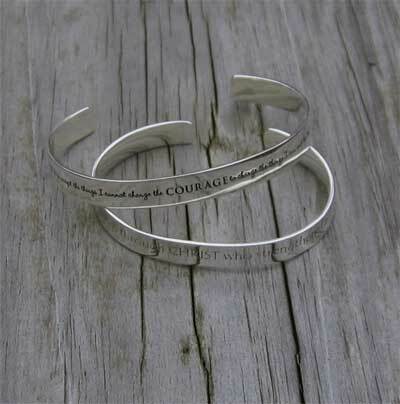 This sterling silver cuff bracelet is finely engraved with the Philippians 4:13. "I can do all things through Christ who strengthens me.". 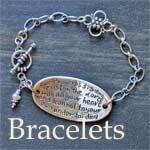 This bracelet carries a quotation from the Epistle Paul wrote to the church he founded at the Greek city of Philippi, the first Pauline Church in Europe. It was written around 60AD from a prison cell in Rome, though this is a subject of some debate. Paul thanks them for their support and reminds them of their duty to one another, and their trust in God's provision, culminating in this beautiful line which exemplifies the strength which faith provides. From the King James version of the bible.